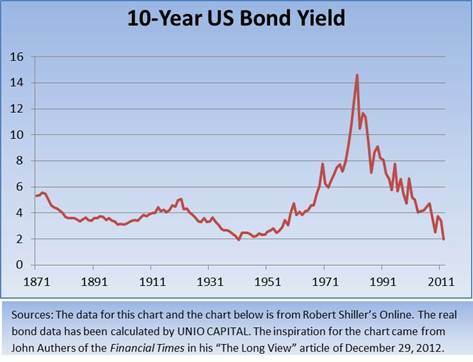 The message of the two charts below showing 141 years of US 10-year bond history is not: “we are about to experience high inflation”; is not bond yields are about to shoot up to 10%; or is not that the opposite might happen and these low bond yields might be the ultimate symptom of a prolonged period of low growth ahead. Any one of these messages might be true, but I believe we’re misreading the charts if we think these messages are clear and inevitable. No, the only unequivocal message in these charts that I see is that bonds are on a hair-trigger. Bond yields and prices are in such uncharted territory, historically speaking, that tiny hints of changes have a magnified effect on them and an explosive impact on those investors who hold them. For example, yesterday, January 3rd, minutes of the FOMC hinted that the voting governors might be considering an end to QE-i (“i” for “infinity”). The price of the 10-year bond fell -3.9% in one day. And as I write, the long bond has fallen since September 28th -15½%. The good, old safe long bond! And not much has happened really. The economy has grown pretty well. Inflation is running at -1.8%. Gold is falling, down -7% since September 28th. The fiscal cliff possibly happening was a tonic for a while for the long bond which likes anemic growth and loves recession. Sure, Bill Gross is back to talking about inflation around the corner – but it’s still around the corner. But in the end – objectively rather than what’s happening in our heads – not so much is going on in reality to warrant the big, jerky moves in the long bond. No, bonds have been doing badly (and could just as suddenly do well again if, say, the debt ceiling talks lead to more recession fears) because bond yields are in such historically low territory that the mere hint of a condition adverse to bonds (like possible Fed tightening or expected inflation) triggers sharp price declines, as does its opposite, the mere hint of a condition favorable to bonds (like poor economic data or world crises). Breaking away from the past. The first chart above gives some sense as to why bonds are on a hair-trigger. Yields today are lower than they were during the deflationary 25 years of 1871-1896. They are lower than the mid-1930s Great Depression years. As a former historian, I see history as a series of continuities and discontinuities – continuations of the past versus breaks with the past – and bond yields today are certainly a break from the past. But look at real returns! But it’s the second chart below that really tells what’s behind the hair-trigger story. Real bond yields were all over the map – very up-down, very volatile – from 1871 till, say, 1953. From 1953 to 2012 – 59 years – things steadied. The average real bond yield (the actual bond yield minus inflation) was 2.4%. See where the green arrow is pointing from 1953 forward. However, the average real bond yield of the past 5 years (2008-12) is 0.77% and, in two of those five years, the real yield was negative: -0.59% in 2008; and -0.96% this past year, 2012. See where the yellow arrow on the right is pointing. There have been only 5 other occasions since 1953 when real bond yields have been negative: 1958 (-0.53%); 1974 (-2.40%); 1975 (-4.30%); 1979 (-0.11%); and 1980 (-3.11%). Obviously the cluster of four negative real yields took place from 1974-80 when the US last experienced a real bout of inflation. See where the orange arrow is pointing up. It’s the negative real yields. As you can see from the yellow arrow above, we are today flirting with negative real yields as we were in the 70s where the orange arrow is pointing. We’re doing so for different reasons – so would say Ben Bernanke – and for better outcomes as he would also say. But regardless of whether you listen to Bill Gross waiting for a Hoover dam of money to flood the country with inflationary dollars; or to the Governors of the Fed who believe they will long since have raised rates before the Hoover dam cracks – you can see from this chart of real-rates why the world of bondholders is, and will be, on a hair-trigger. And it is that hair-trigger atmosphere from which I am afraid there is no escape for the foreseeable future.